Currently our Hemp Paste Finishing Wax is available in Original Formula and we also have it available (2oz only) in Pearl Pixie. 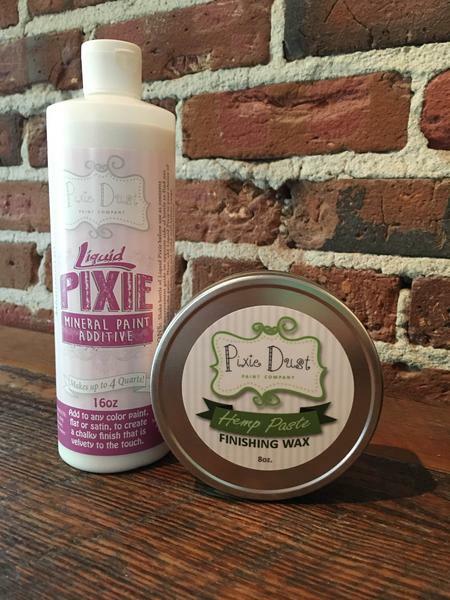 Pearl Pixie adds a little shimmer to any project. Whether it's for a childs room or a patio sigh, the pearly iridescent finish will make any project shimmer. For centuries woodcrafters have used a variety of natural oils, waxes, and pastes to seal their masterpieces. In today’s world of endless “wax” options, there are very few that go back to their natural roots. Our Finishing Hemp Paste Wax is the only one on the market, that is 100% all natural, vegan friendly, and made from simple organic ingredients. Hemp paste is the oil and wax all in one making for a product that is all “green”, easy to use, and provides BEAUTIFUL results. Hemp Paste is a combination of Organic Cold-Pressed Hemp Seeds and Candelilla wax with a hint of plant based essential oils. As you can see all 3 products used in our one of a kind Hemp Paste are 100% plant based, making the product Vegan friendly! It also contains no tree-nuts, GMO’s or Soy, making it friendly to those with nut allergies. Hemp Paste can be used on natural, stain, and painted woods, as well as leather. Our product enhances the color of all types of paints including Milk Paint, Chalk (like) Paints, and Mineral Paints, it will never alter the color or cause yellowing. Hemp Paste will also not “pool” like hemp oil, so you will be able to properly protect your piece without the worry of adding too much or not enough. This product works the same way as any furniture wax and should be used in the same manner.